In 2011 I was featured on local news programs and the CBS Morning Show to talk about the meaning of 11/11/11 and Numerology. I have been practicing this art for 45 years. I hope you will enjoy this information. Like Astrology, Numerology is just one more avenue to help us to understand ourselves and each other. It is best to go by both systems in your life in order to get a full and detailed description of you or the other party. 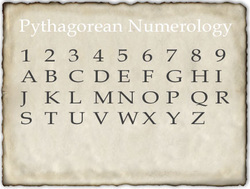 Each letter in your name corresponds to a number in this picture. Add them up and when you get a large number, for instance, 37, add the 3 and the 7. You will get 10. Add the 1 and the 0 until you get the single digit, 1. Do the same with your entire birthdate, using the numerical month, i.e., 10/19/1957. Note: If your full birth name or birth date reduces down to 11 or 22 or 33, read the definitions of the 2 Life Path or the 4 Life Path or the 6, respectively, before moving on to the Master Number section below. ONES are independent, self motivated, and hard workers. They have a strong desire to be #1. They are critical of themselves and as a result, can be critical of others. When the 1 Life Path has won a personal victory, their face radiates with pure joy. Multitasking is something they tend to be very good at, and keeping busy is important to them. The 1s will not tolerate laziness from the people they spend their time with. TWOS want peace. They make good mediators.They are very loyal, and when they say that they love you,count on it!They welcome companionship and the chance to share their lives with someone special.The flip side is that if they feel threatened or pushed to the wall, they become the terrible 2s. But ultimately, they do not want conflict. THREES communicate in all areas: written word and verbal. Writers, radio broadcasters, actors, singers, performers, counselors, and they are the natural comedian. They can be manic depressive if they do not use their creative energy and tend to exaggerate the truth. Known for their trademark smile, eyes and voice. FOURS seek security. Home is their haven. They are usually very cerebral and need to find ways to relax their minds. Like NIKE, "Just Do It." Otherwise, great ideas live and die in their heads.The 4s like to be organized and to put things back in their " proper place". If their home environment appears sloppy and unkempt , that is a sign that the 4 Life Path person is not doing well. FIVES seek freedom, fun, adventure. If they do not live the adventure, their lives become way too dramatic. They are the natural detectives and celebrators of life (holidays are usually their specialty). 5s have a hard time settling down and have a fear of being trapped or smothered in a relationship. Chaos can be a theme for their lives. SIXES are nurturers. If men, they rescue damsels in distress. If women, they mother the "little boy" in their men. They should manage or run the company. If every thing is going smoothly, they must be careful not to ruin it. They tend to put people on pedestals which then topple. Magnetic. People are drawn to them. Their moods affect the room. SEVENS are another cerebral number. They have a loner quality. They need to learn to have faith. They have a love of natural beauty: ocean, green grass, plants, flowers, etc. If they do not have faith they tend to become very cynical and escape through drugs, alcohol, work, and geography. They have an air of mystery and do not want you to know who they are. EIGHTS do not feel safe unless they have found a way to establish financial security. It is difficult for the 8s to take advice.When they make a choice, they must feel it is their decision, NOT SOMEONE ELSES. As a result, they do tend to learn the hard way. 8s are very honest and by being so blunt, they unintentionally hurt feelings. Although they can sometimes appear insensitive, what is going on inside them is the exact opposite. They do feel deeply about everything that goes on in their lives. NINES are the natural leader. People assume they are in charge even if they are not. If in a department store, people think they work there. They take care of everyone else but need to learn to speak up when they need help, love, and hugs. 9s often feel unloved or abandoned by their mother or father, or they feel completely responsible for them. It's hard for them to let go of the past. If you were born as a Master Number (either birthname or birthdate) it is when your soul has a special life mission. You are able to work on Mastery at a higher level than ordinary number person. You are here on a mission to build, to teach, to heal.The Master numbers are 11, 22, 33. Each one is an extreme of the single digit version. You can take the description above for that number but then you intensify it and also you add in the following characteristics. See my Royal Baby predictions blog for more about how these numbers affect the person. Traits of Master Number 33: 6 to the extreme, i.e., very nurturing, caring, generous.